Monster Energy is a brand of energy drink manufactured by Monster Beverage Company of Corona, California. It was one of the first drinks marketed in a 16-ounce can, nearly twice the size of the typical "bullet" size can of many other energy drinks, but for around the same price. It is available at most supermarkets and convenience stores in the U.S. and Canada. 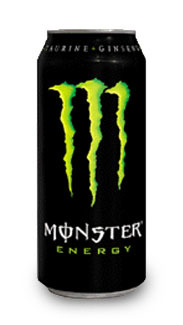 The original Monster energy drink comes in a black can with a green "M" logo. Monster pull tabs are unique from standard pull tabs in that they are punched with an "M" instead of a large hole. One can find a Monster with the standard tab, albeit in the proper color. All variants also come in 4-packs of the 16-ounce.